Action thrillers are like an ice-cream. You need to be quick with your reflexes to let it from melting. The reader needs to on his toes and his mind should be sharp to catch the details. 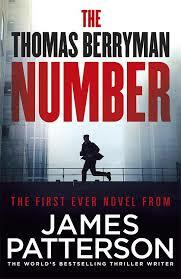 Author James Patterson in his book " The Thomas Berryman Number" is going to let readers experience a different tell tale. A thrill never sought and action never believed or committed. Will he be able to deliver the goods? Let's find out. First look at the cover and the lone running black figure shouts mystery. The title clouded and reeking thrill. The blurb short and sweet, twisted and simple, yet ineffective in capturing the readers imagination. The shortcoming of the book is its failure to give a high octane summation to catch the eye. The story is set in America, where three people are found murdered in Nashville. The assassin is missing, the accomplices in a dilapidated state and the biggies of the system as clueless as ever. It is now a cat and mouse game. Thomas Berryman, the charming and evasive assassin, his hits and the last job which will glorify or break his legend. Read out more to find about Thomas Berryman. The book has a strong backing in terms of a story line. Three murders, an alluring assassin and number of people involved in the entire scenario. It makes the entire set up as demanding and wanting you want it to be. But there is very less to talk about in terms of positive. The positives end with the initial outburst of the story. The demand to churn a thrill in the story takes severe toll. There are major hiccups. The characters are completely out of sync. There are no bases covered when it comes to setting up the story and the momentum is haggard. There are times when the conversations drift into gloominess. The closeness of the accomplices knit vague and pale. The threads come undone by the time the book is done and dusted. The knots loose. The ideas seems convincing but it runs amok and self destructs the entire plot. The feeling of nothingness seeps in the entire story as the dots are never connected when required. All in all the book had a lot of potential to make it big. Alas, there is no way it makes a reader feel comfortable. The idea is to capture the hearts, let the hearts flutter but the beat is missed time and again and even a hyped Thomas Berryman fails to generate charm. His character, the story are unimpressive and the ensemble is in shambles. The faith is lost when an action thriller fails miserably. This is that one time.